A warm welcome to all those who are joining us for the first time after encountering us in D.C.! We are back from AWP, and we’re getting ready to roll once again over here on the blog. The conference and reading went wonderfully (look out for more about our experience in our upcoming post-AWP reflection posts), and we were delighted to be able to hand out 103 postcards as part of our 2011 Postcard Project. 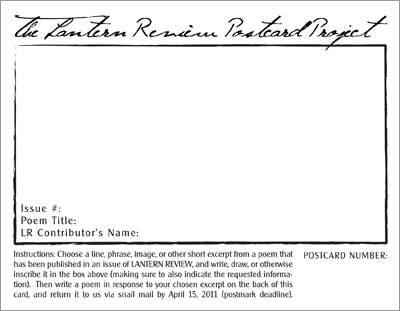 For those of you who are just joining us, or who didn’t catch the explanation that we posted before the conference, the LR Postcard Project is a special venture that we’ve devised in order to encourage creative responses to the poems that we’ve published so far in Issue 1 & Issue 2. We made up a series of 116 uniquely-numbered postcards, featuring either pre-selected “shimmery bits” (quotes, excerpts, lines, images, what have you) from poems that appeared in our first two issues or a blank front (where you could fill in your own favorite “shimmery bit” from an LR poem), and asked people at AWP to take one home, to write a response to their chosen excerpt in the form of a poem on the back, and to mail it back to us by April 15th. The idea here is that we will post the cards that we receive to the blog (as they come in) and that we’ll even choose a few that we particularly like to publish in an upcoming issue. Leave a comment on this post with your name, a contact email address, and the title of your favorite poem from Issue 1 or 2 of LR. We will contact the first 13 (human/non-spam/individual) commentors for their mailing addresses and will send them each a postcard via snail mail. If you receive a card, all you have to do is to inscribe a short quote or excerpt from a poem in Issue 1 or 2 on the front of the card, write a poem on the back in response to that quote, stick on a postcard stamp, and send it back to us by April 15th. Hi, I just discovered your journal earlier this year. I love so many of the works in LR, but my favourite has to be Frances Won’s ‘On Dating Small Town Guys’. I’m a sucker for azn-culture-through food! I love “Life as a Girl” by Angela Veronica Wong, although I can’t say why, or how.